Today I did the last of this year’s school visits to Woodcroft Junior College. I worked with two Year 2 classes and talked about the making of a book and how I have managed to get my books published . I read The Man with Small Hair, Limpopo Lullaby and then we looked at Tea and Sugar Christmas as I have a few relevant items to share with classes about the Tea and Sugar train. A very keen and interested, interactive group of students. I even got a piece of delicious carrot birthday cake in the staffroom at recess time. Thanks to whoever it was who celebrated their birthday today. Thanks also to Kate O’Driscoll, Cathy Hank, Julie Byrne and Maryann Pearson. 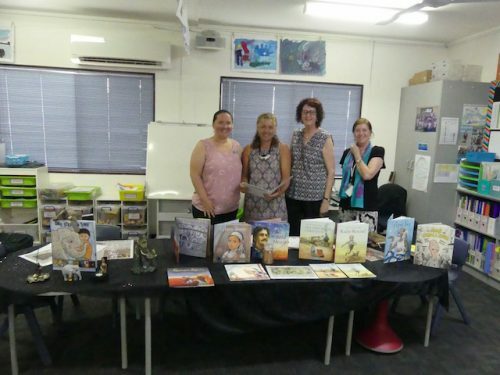 It’s a small world…I used to teach with Julie’s daughter when she was at Eastern Fleurieu School and I have known Cathy’s cousin-in-law Deb Hank (Carmichael now) since 1969 First Year High School at Henley High!! « Previous PostIt’s Launched! “The Man with Small Hair” is out in the world.